Yes, you can have lentils on the low FODMAP diet … with a few considerations. 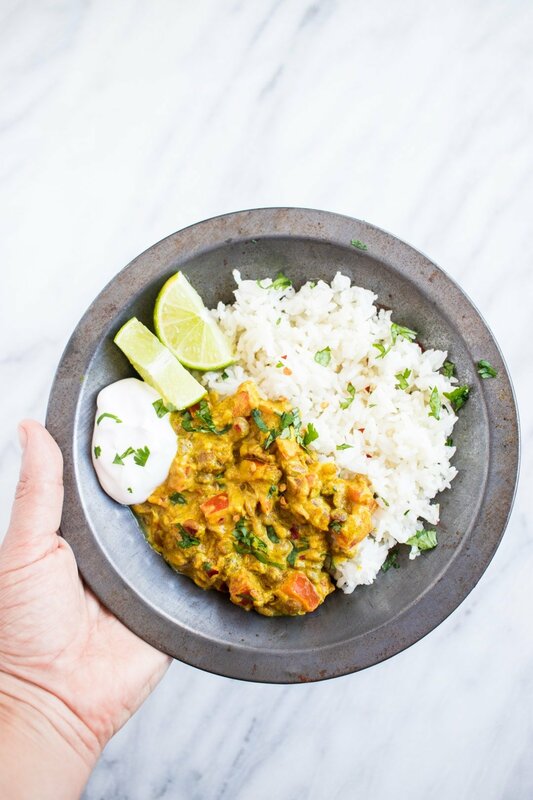 Let me show you how with this flavorful, Indian-inspired Low FODMAP Lentil Dal. It’s completely plant-based and takes less than 15 minutes to make! Some of you know that travel is something I find immense value in. I’ve learned so much about myself and about others through my global adventures that I consider travel to be such an incredible and invaluable educational experience. No, it’s not the most affordable hobby to have, and yes, I am very grateful for and aware of the privileges I’ve had to travel, but travel is also one of the very few non-essential items I have chosen to spend money on in my adult life. After Al and I became debt-free in 2015, we decided to save up for and take a handful of crazy once-in-a-lifetime adventures. Now that our planned adventures are complete, we’ve switched back into gazelle intensity mode (for any of you Dave Ramsey followers out there) and are working to knock out some major savings goals for our future (Baby Steps 4, 5 and 6). We will most definitely travel again … someday, but in the meantime, I’ve been looking for more affordable ways to quell my wanderlust. 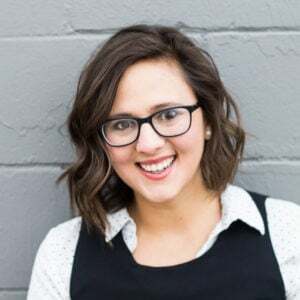 Because one of the things I love most about traveling is the opportunity to experience new foods and new flavors, I’ve decided to combine my love of FODMAP-friendly food with my love of travel. So, every once in a while, I’ll be sharing a FODMAP-friendly recipe inspired by a dish from somewhere around the world as part of this series called “Around the World Low FODMAP”. It might not always be the most authentic recipe in the world, but it will be realistic, FODMAP-friendly, and delicious. 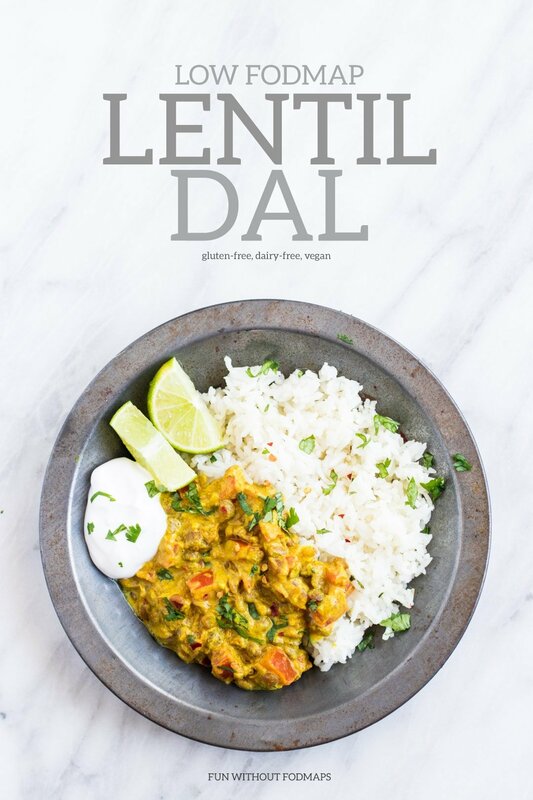 Let’s jump right into the first recipe, low FODMAP lentil dal. Lentil dal is kind of a misnomer because, from my understanding, dal means pulse (or lentil) in Hindi. But, I felt it necessary to include lentil in the name as some might not know what “dal” is. The dish itself is a yummy spice-filled Indian curry. 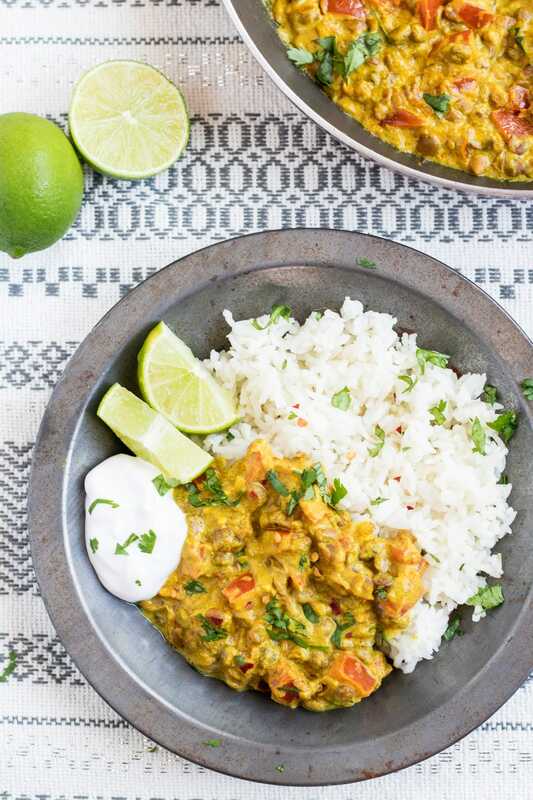 It’s filled with tomatoes and a creamy coconut-based sauce that’s perfect for serving over a big scoop of basmati rice. In addition to lots of Indian-inspired spices, this recipe is a little spicy (heat-wise), as it’s written. So, if you’re not keen on heat, I’d recommend either removing the seeds from the jalapeño before adding them in or omitting the pepper altogether from this recipe. Traditional dal can take hours to make. So, with the help of canned lentils and few adjustments, I’ve sped up the cooking process to make this recipe more realistic for us busy FODMAP-ing folks. 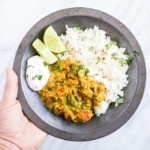 In fact, this low FODMAP lentil dal takes only about 15 minutes to make! It’s perfect for a quick and easy, plant-based meal! Now you might be thinking, how can I have lentils on the low FODMAP diet? Aren’t legumes off limits? Well, I’m happy to say that canned lentils can “safely” be enjoyed, if you keep a couple of things in mind. Second, canned lentils have less FODMAPs than lentils that are cooked at home from scratch. Why? FODMAPs are water soluble meaning they “dissolve” in water. So, more FODMAPs have the opportunity to leach out of the lentils during the canning process and when they’re sitting on the shelf. Just remember to drain and rinse your canned lentils to help further remove FODMAPs before using. WHERE TO FIND CANNED LENTILS? I’ll be honest, I have had a little difficulty finding canned lentils up until very recently. One big box grocery store and a local food co-op in my area just started carrying the WestBrae brand. If you can’t find them in your local grocery store, Amazon also sells them. Yes, you can have lentils on the low FODMAP diet … with a few considerations. 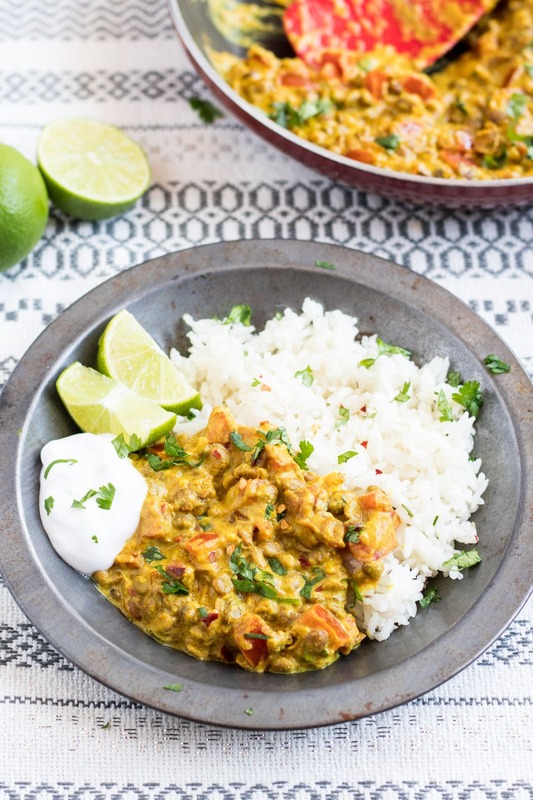 Let me show you how with this flavorful, Indian-inspired Low FODMAP Lentil Dal. It’s completely plant-based and takes less than 15 minutes. Heat olive oil in a saucepan over medium heat. Add diced tomatoes, ginger, and jalapeno halves and cook 2-3 minutes, stirring occasionally. Add canned lentils, coconut milk, water, turmeric, garam masala, cumin, and coriander. Stir to mix. Bring mixture to a brief boil. Reduce heat to low, cover, and let simmer for at least 5 minutes, stirring occasionally. Remove jalapeno pepper halves, stir in lime juice, and season to taste with salt. Serve warm over basmati rice with optional garnishes. Jalapeno Pepper: Seeds can be removed from jalapeno halves prior to cooking to decrease spice level. IBS Note: Green chiles (like jalapenos) are considered low FODMAP. However, chiles contain capsaicin which gives them their spicy flavor. This can be a non-FODMAP IBS trigger for some. Canned Lentils: A low FODMAP serving of canned lentils (drained and rinsed) is a ½ cup or 46 grams. Canned Coconut Milk: A low FODMAP serving of canned coconut milk is a ¼ cup or 60 grams. Coconut Yogurt: I really like CoYo Natural Unsweetened Coconut Yogurt. According to Monash University, a low FODMAP serving of generic coconut yogurt is 1 tub or 125 grams. As CoYo is really thick (and not officially tested), I suggest starting with small amounts (like 1 Tbsp.) and increasing based on tolerance. Never knew about canned FODMAP’s being more tolerable.Will definitely be giving this recipe a shot as the diet is ultra boring sometimes ?. This is so yummy! 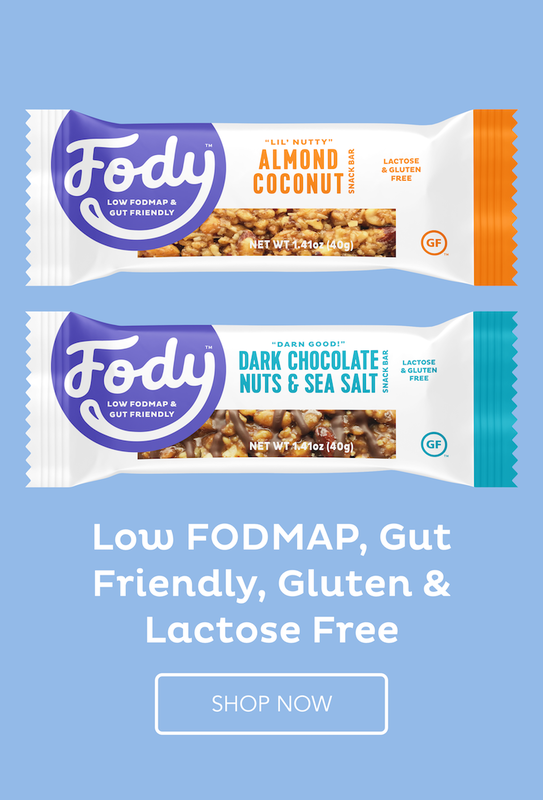 I love finding recipes that are both low in FODMAPs and delicious for FODMAP eaters too and this is definitely on my list now!